Who has no idea about electronics but want to test Arduino & develop something, this guide Tools Needed For Arduino is good to read for long term. We have some basic articles around Arduino like difference between Arduino and Raspberry Pi, Basics on Arduino etc. Tools Needed For Arduino : Kit or Board? For real kids, Kit is better. But it is not cost effective to buy a kit by a 18 years or 30 years “kid”, then “mother kid”, “father kid” etc. They can set their goal and search the needed components and guides. Buying separately after doing a market research will decrease the total cost for the project. In serious words – pure learning by a kid can be helped by a kit. But buying an Arduino UNO board (with the USG plug) separately will save huge money. Arduino is NOT electronics. There are many boards, hence there are some standard equipments and tools which are often used by a typical DIY electronics hobbyist. We suggest to try the board with USB plug first. In India, the cost of an Arduino UNO is around $7.00 We worked and playing with DIY, our fathers did, grandfathers did – most of us has lot tools. But, not all has the required equipments even to play with an Arduino board. First, we download the Arduino development environment and install it on our computers which includes everything we need to start writing the programs. We connect the Arduino UNO board to our computer after installing the softwares. Then we get started with the Arduino editor. There is a Board option and we select the model of Arduino. The second option is the Port option, which we choose where the Arduino is plugged. Computer, that software, the board – they are also tools. We suggest to seek an Arduino UNO board at bargain price. Gloves are standard tools for any electronics DIY works. Specially for Arduino, a 12V DC power supply with a 2.1 mm jack is needed. It is better to have a multimeter. Normally we use a breadboard. Breadboard used since our grandfather’s era, it is a construction base for prototyping of electronics without the need of soldering. Also a general purpose DIY printed circuit board is available – they are for soldering. That Breadboard is typically double looking. We recommend to read about Breadboard on Wikipedia. Specifications are written there. Always buy a good breadboard. A bad breadboard can destroy everything by short-circuit. In order to connect with this Breadboard and Arduino UNO board, wires are needed. Jumper wires are used for this purpose. There are male and female connector ends of these jumper wires. For our purpose, both ends are male. We will use Tweezer to handle them. To increase their lengths and for other purposes, we need one end female. Dupont makes Jumper wires nice, they are commonly used in computing stuffs. Only selling jump wires, Adafruit made a good fortune! If you sell 40 pc. jump wire at the price of 100 pc. you’ll also make fortune! These are 22AWG jump wires. Some, red, green and blue LED lights; 100, 1K, 10k ohm resistors are enough. Alligator clips are commonly used. You might need them. There many such small stuffs. 3V DC motors are sold at very cheap rate in Ebay along with fan blades for the kids. Display if used, they are 0.96″ SPI IIC display. There are color display – OLED Dot Matrix Display. With kit you’ll get a basic LED display. There are other stuffs like micropump, servomotors etc. Unless you are a kid, do not create stuffs which has no use. After prototyping on breadboard, you actually need a PCB – this printing PCB is 100% DIY work. Then you’ll solder them. Basically, most of you have less idea about electronics DIY works, whenever the sellers understand you are a noob, they’ll charge more. Avoid searching in Ebay, Amazon with the word “Arduino”. See the difference of price between searching with “22AWG Jumper wires” and “Arduino Jumper wires”. DIY electronics stuffs for basic works never cost a huge. How many people buy them? Often stocks become older and they run on offer. This Article Has Been Shared 5348 Times! Distributed Computing is a model for solving computational problems using a large number of computers organized in clusters in a distributed infrastructure. Cloud Security Solutions for Tablets and Smartphones covers the issues with lost or stolen mobile devices, accidental data deletion, App security and Malwares. LCD Monitor as Television has several advantages over pure television apart from being at least 25% cheaper with all the needed things. Cloud Server, PaaS, VPS, Dedicated Server, Colocation Server – lot of options for hosting from Free to few thousand dollars per month. Which one to pick ? 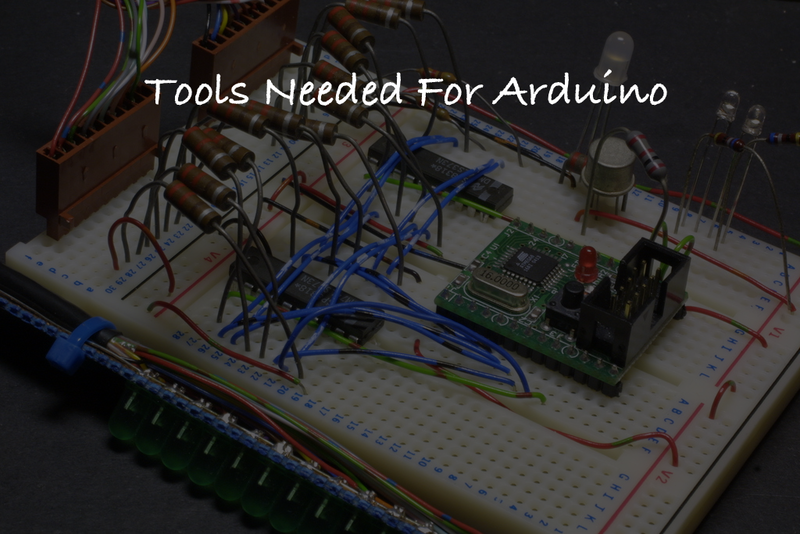 Cite this article as: Abhishek Ghosh, "Tools Needed For Arduino : Beginner’s Guide," in The Customize Windows, June 22, 2015, April 23, 2019, https://thecustomizewindows.com/2015/06/tools-needed-for-arduino-beginners-guide/.